Original image by Chris martin wildlife photography. I had so much fun recreating the feather detail of this little guy. 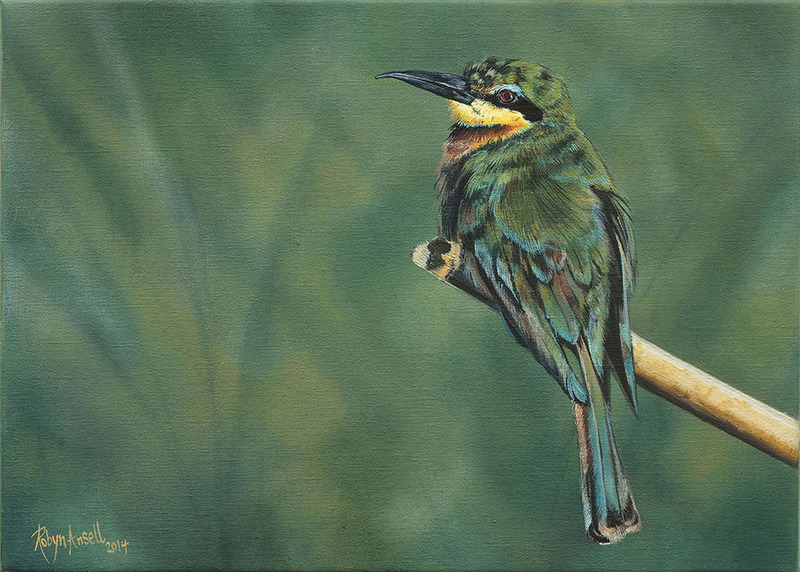 Bee-eaters are always popular subjects to paint. When you see them perched on branches or reeds in the bush it is always amazing to see just how delicate they are, and how striking their plumage truly is. I love painting the feathers of bird subjects and this image of Chris’s was particularly rewarding to work on, what with the way the feathers on the back are puffed up. I just love the soft tones of blue, burnt sienna and green evident in the feather colouration, good practice for fine brush stroke work.